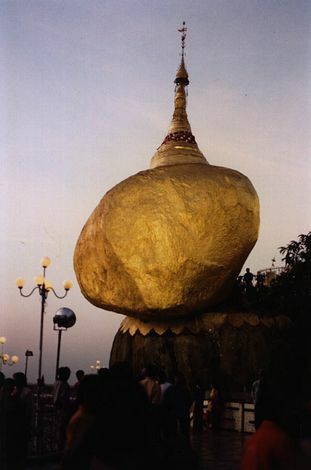 At Kyaikto a branch road heads inland; at it end, pilgrims by the hundred come every day in the dry season to climb a mountain upon which this gilded and balanced boulder sits. At dusk and dawn, when the sunlight glints off the rock in a dark sky, it's especially powerful. Legend has it that a hair of the Buddha keeps the rock propped in place.